10-Volumes from Henry Law, a pastor in the Church of England and a prolific writer. Henry Law (1797-1884) was a pastor in the Church of England. He was a prolific preacher of God's Word and penned a number of works that are now available in PC Study Bible. Law writes with conviction and a clarity that inspire readers to this day. The main glory of this book is its identity with Christ. He brightly shines throughout its varied hymns. He is constantly the speaker, and in these breathings of His Spirit we receive convincing evidence that, without ceasing to be God, He was a perfect man, and preeminently a Man of Sorrows. We here are supplied with a vivid portrait of His character, His work, His love, His sufferings, His glory. It would be no difficult task to construct a Gospel from its prophetic language. It may be regarded as His manual during His career on earth. When, as the expiating God-man, He was uplifted on the accursed tree, and the iron entered into His soul, His misery goes forth in the moanings of a Psalm, "My God, My God, why have You forsaken Me?" He gives up the spirit uttering its confiding terms, "Into Your hands I commend My spirit." He ascends amid the shouts, "Lift up your heads, O you gates!" He receives the welcome, "Sit on My right hand." The aim of this volume is simple, yet sublime--lowly, yet rising above earth. Its desire is to promote and elevate and sanctify the communion of families with heaven; to give wings to piety, and warm utterance to prayer. This exercise requires watchful care--the often recurrence militates against impression. An object always present to the eyes scarcely arrests notice. The lull of one repeated note will wrap the senses in forgetfulness. Hence fruitless formalitymay creep in, and dull routine may slowly move where liveliness should burn. True worship is the heavenward elevation of the soul. To obtain this benefit is worth all efforts. 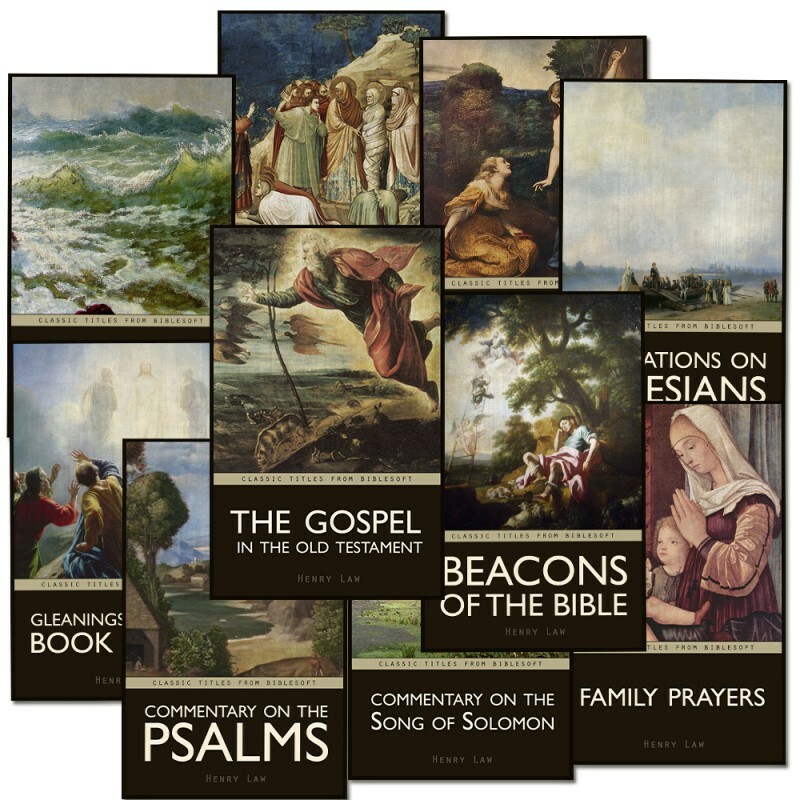 A collection of sermons on Biblical themes. Is it not beyond all controversy, that apart from living faith in Christ, there is no pardon for sin, no cleansing from iniquity, no reconciliation with our heavenly Father, no access to Him, no welcome to the sacramental feast, no peace of conscience, no hope of heaven, no escape from hell! Is it not as indisputably true, that outward means are not the link which join the soul to Christ, and that the senses gratified are not the heart converted, and salvation won! We are infallibly taught, that the proclamation of the Gospel is the heaven-appointed instrument to minister such blessings. No substitute can take its place. Devotional commentary on Ephesians. Wide and diversified is the work belonging to the Church of Christ. In the household of God there is no pillow for the indolent. The term, 'an idle Christian', involves a contradiction. It has scarcely more meaning than a rayless sun—a waveless ocean—a noiseless waterfall—a rose without perfume. In this community each member has his appointed place. "We are His workmanship, created in Christ Jesus unto good works, which God has before ordained that we should walk in them." "Not slothful in business, fervent in spirit, serving the Lord," is the universal rule. The final welcome is, "Well done, good and faithful servant." Sermons on passages from Genesis. The Bible is God's Book, therefore it is all divine. Each page gives proof. No human thought could originate such truths. No human mind could so unfold them. Infinite breadths and lengths--eternal depths and heights, are marvelously wrapped up in a few brief words. Enlightened readers see the sure conclusion--this author is more than man. 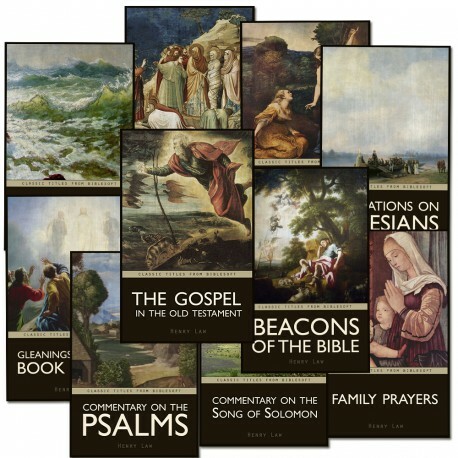 A collection of sermons/tracts available in PC Study Bible as a commentary. The tree of forgiveness, shaken by the hand of faith, pours down rich fruits. From the showers of descending blessings let holy joy be now selected. This bright inhabitant of the believing heart quickly springs from the glad tidings--"Son, be of good cheer; your sins are forgiven." Joy is the product of this sweet assurance of forgiveness--it is among the rays which sparkle from the absolving work of Christ. A collection of devotions. Each woman's son is born an heir--not to a palace or a crown, not to broad lands or mines of gold, not to ancestral lineage of fame, not to high rank among the rich and great, not to a soft seat on luxury's lap, but to the inheritance of a common portion--TROUBLE. Few are called to be honored and caressed, to be idols of admiring crowds, to outstrip others in the worldly race, to enjoy sound health and sinewy strength, to overabundance of sublunary goods; but many are called to suffering. Our usual walk is in a valley of tears. The billows of affliction swell around us, and storms of distress, with little intermission, buffet us. Two devotional tracts. If there is a picture, in which all enchanting beauty shines, it is that which represents the state of the children of God by faith in Christ Jesus.--Gal. 3:26. Every joy should glow in their cup. They are called to a song swelling with melody, which cannot be more sweet. They are invited to a garden, in which each fragrant flower ever blooms. They are enjoined to sit down beneath the shadow of a tree, on whose extended branches most luscious fruit forever hangs. A volume is presented to their hands, written inside and outside in glowing terms of bliss--in which every page is calm and bright, and where perusal never wearies. Thus blessed is the heritage of faith. A collection of daily & seasonal prayers and devotions. Also includes as a PCSB Desktop Devotional. O Lord, our Lord, how excellent is Your name in all the earth! You have set Your glory above the heavens. From Your high throne behold with gracious eye—Your humble servants. We would not cross the threshold of this day, without committing ourselves, our souls and bodies, all our concerns, and all our friends—to Your guardian care. We know that we are not our own; we desire to be wholly Yours. Watch over us, keep us, guide us, direct us, sanctify us, and bless us. Incline our hearts to delight in Your holy ways.